It’s great to know how to quickly whip up a pie or tart to create an impressive result. A good pastry case can be loaded with any variety of fillings. I’ve gone for classic bacon and egg with a twist, as this is always popular with my family. Roll out pastry to 3mm thick and use to line a 11cm x 36cm rectangular tart tin, leaving a little extra overhang on all sides – this allows for pastry shrinkage during cooking. Prick base all over with a fork; chill for 30 minutes. Preheat oven to 210°C. Arrange bacon to cover pastry base. Break eggs into a bowl, add cream and parsley and season well with salt and pepper. Gently stir with a fork to only partially break up the eggs. Pour egg mixture around the bacon. Scatter with cherry tomatoes. 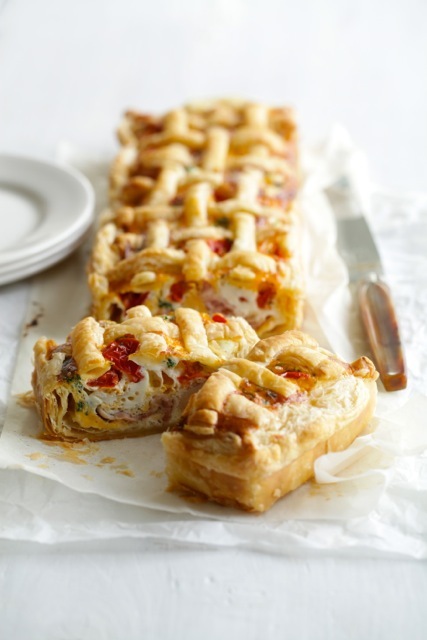 Roll out scraps of pastry, cut into long strips and use to form a lattice on top of the filling. Bake for 35-40 minutes or until egg is set and pastry is golden brown. Slice to serve hot or cold. This entry was posted on June 1, 2017 by julie.